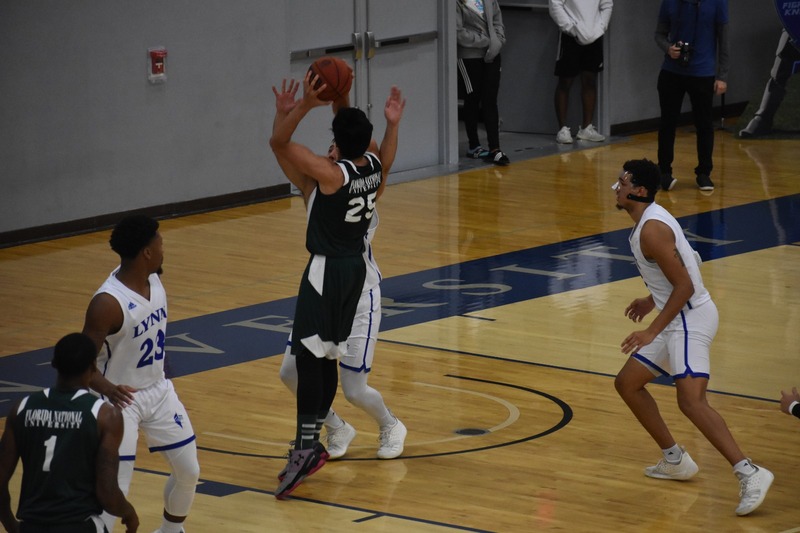 BOCA RATON, Fla. – Florida National University came out with guns blazing on Friday night, putting the Lynn University men’s basketball team in an immediate hole. The Fighting Knights slowly chipped away, taking a halftime lead before holding off the Conquistadors for an 89-78 non-conference game. Follow us: @FNUCONQUISTADORS on Facebook, Instagram, Twitter and YouTube. Kenneth Santos (FNU) finished with a team-high 22 points on 8-10 shooting. Additionally, Santos brought in 4 rebounds and 2 assists. Antonio Sims (FNU) collected 17 points on 7-13 shooting and 4 rebounds, Nico Rojas recorded 10 points and 3 assists. The Conquistadors won the rebounding margin as well, out-rebounding Lynn University 29×26. The Conquistadors had the hot hand, shooting 52.5 percent for the game and were 9-of-24 from Downtown (37.5 percent). FNU held a 29-26 advantage in rebounding and scored 23 fast-break points. Florida National opened the game on a 16-4 run. FNU has played seven more games than Lynn so far this season. ON THE HORIZON: Conquistadors will play the next game against NOVA University today at 4:00 PM at Davie, FL.